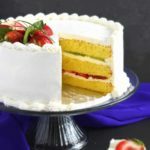 Strawberry Kiwi Cake: an easy all-time family favorite fruity dessert. Moist with layers of fresh strawberries, kiwis and sour cream frosting. Preheat the oven to a 350°F. Line bottoms of three 9” nonstick springform pans with parchment paper; oil or spray sides, wipe edges with a paper towel. Set aside. MAKE SPONGE CAKE LAYERS: Into a large bowl, separate 5 eggs and add the egg yolks to the bowl. (refrigerate egg whites for other baking). Add 8 full eggs and 1 cup sugar. Using mixer, beat on high speed for 8-10 minutes until eggs are light in color, thick and fluffy. Sift 1 cup all-purpose flour into the fluffy egg mixture one third at a time. Fold with a hand whisk (works the best) with each addition just until incorporated. Scrape from the bottom making sure no streaks of flour remain. (Do not over-mix or you will deflate the batter). Divide batter evenly into 3 pans or 1 straight into springform pan and the remaining 2 portions in separate bowls. Bake 1 pan at a time for 15 minutes until wooden toothpick inserted in center comes out clean. As soon as one layer finished baking, bake another. Do not let the batter sit for too long. Once cake is baked, use a thin spatula to loosen cake layer from the rim of the springform pan, then remove the rim. Transfer sponge to a cooling rack to completely cook before frosting. Thinly slice 6 large fresh strawberries and 3 fresh kiwi. Set aside for later use. MAKE THE FROSTING: Using a stand mixer, beat 16 oz sour cream, 8 oz cool whip, 3/4 cup sugar and 1/2 tsp vanilla extract for 10 mins on high until frosting is thick and firm. Refrigerate until ready to use, but not for prolonged time or the cream might become slightly runny. Generously frost the sides and top of the cake. Use pastry scraper to smooth out edges and top of finished product. Decorate with fresh strawberries and/or kiwi. Refrigerate cake for several hours before cutting. This cake is good for 2-3 days.